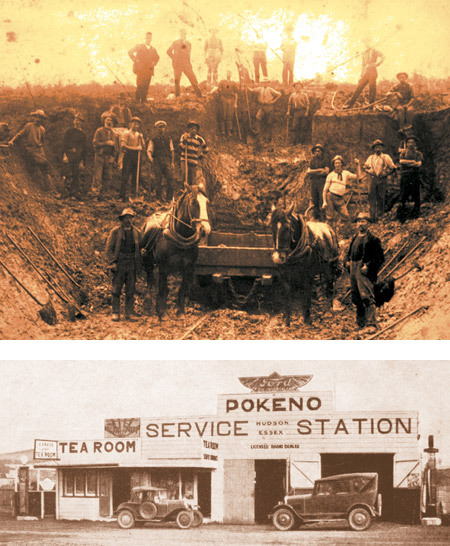 With a rich history spanning many generations, the face of Pokeno has constantly evolved. From the Maori who first lived off the fertile land, and the Military who began construction of the mighty Great South Road, to the Early Settlers who developed the township further after the Gold Rush of the late 1860’s. For those very first inhabitants, and many who have taken up residence since, Pokeno - meaning ‘a place of refuge’ - has gained the reputation as a safe haven where people can escape the stresses of city life and relax amongst friends and family. The region’s rich volcanic soil also provided a steady source of food so the area became a natural resting place for the early Maori who formed the beginnings of the very first settlement, raising crops, cattle, horses and pigs, and commissioning the area’s first flour mill. The Military later established themselves in the area during the 1860’s and the Queens Redoubt was formed, a defensive fort shaped from the land, protecting the soldiers as they regained strength from long days progressing the main route south. The area was then surveyed and those who laboured on the roads and surrounding countryside were allotted portions of land. These first titles established Pokeno Village in its final location and it wasn’t long before the first settlers, many who were Scottish Presbyterians arriving from Clyde aboard the Helenslee, heard of the fertile ground and easy access to the wealth of gold being discovered around Thames. Churches, Schools, the Post Office and Railway Station became central to the town’s growth and Pokeno Village was now on the map. The community grew and their productivity blossomed, from the many flax mills, farms, timber mill and creamery. With the advent of motor transport, Pokeno was once again recognised as a valuable rest and fuel stop at the foot of the Bombay Hills, while road construction and maintenance continues to be a source of employment for the village to this day. Sheltered by the surrounding hills, a strong community has sprung from its rich soil, many of whom are descendants of the original settlers. Pokeno was always bound to thrive and now the future awaits for the next generation to flourish.